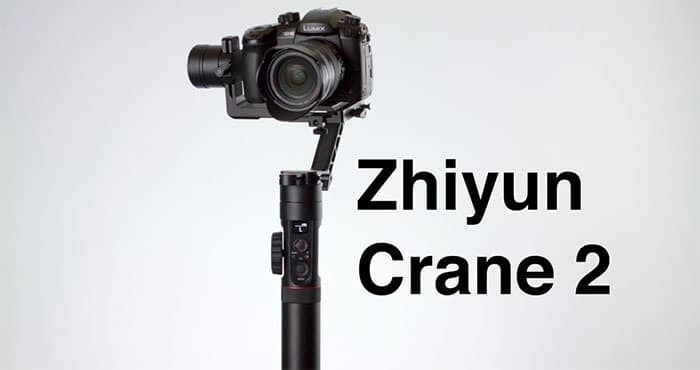 If you’re in a hurry, check out our top pick, Zhiyun Crane 2. For years, amateur videographers were looking for technology to produce professional looking videos. The wait is over. Today, we’ll present some of the best DSLR & Mirrorless camera Gimbal Stabilizers and Steadicams. Whether you’re a professional filmmaker, aspiring blogger or amateur YouTube artist, you understand that great content is what drives your fan base and keeps them hungry for more. But producing great video content is more than just what you say or what you do: it’s how great everything looks when you put it all together. One of the most challenging aspects of filming is keeping your camera steady while you’re moving. The homemade feel was used to great effect in The Blair Witch Project, but shaky camera effects are a niche approach. A shaky camera or a sudden bump can ruin perfectly good footage, forcing time-consuming and potentially expensive reshoots. 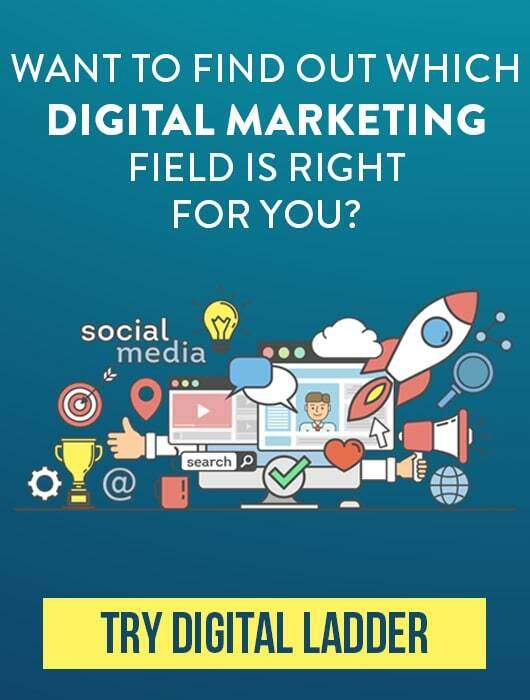 Whether you’re an up-and-coming filmmaker or a Youtube content artist fighting for visibility in a crowded market, you don’t want your content to look amateurish. A great way to improve the quality of moving film footage is by using gimbal stabilizers. Travel YouTubers and famous Instagrammers, all use tools like drones, gimbals, and stabilized cameras to improve their video production quality. Gimbal stabilizers provide the support of a tripod with the maneuverability of your own feet, improving the film quality while you walk and shoot. They are ideal for all kinds of filming project and bring an added level of professionalism and quality to your productions that you are sure to appreciate. That said, there are quite a few features you need to be mindful of before you invest in a camera gimbal stabilizer. We’ll discuss some of these points in the next section, and help you to find the right gimbal stabilizer for your camera. I don’t really need to explain why this is important. The heavier the gimbal (and the camera), the more weight you’ll be carrying with you. Most camera stabilizers are fairly light, but some of them weigh around 10 pounds, and maybe as much as 13 or 14 pounds with the camera secured. The balance of a camera stabilizer is also of paramount importance, perhaps even more so than its weight. Balance is measured by both how well it balances your camera and how easy it is to balance. A balanced stabilizer will be less clumsy to use, making your job easier. While some cheap gimbals don’t use batteries, most models require batteries to power the brushless motors. Some gimbal stabilizers use standard alkaline batteries, but most models employ lithium-ion batteries instead. Unlike gimbals that are designed for smartphones or action cameras, DSLR gimbal stabilizers have to be versatile enough to accommodate cameras of various sizes, as well as accommodate different shooting styles. The most desirable gimbal stabilizers can be set up in multiple ways to accommodate various shooting styles. Gimbal stabilizers can vary in price dramatically. Most models are a few hundred dollars, but it’s not uncommon to find gimbals priced fat $500 or more. Higher-priced gimbals are more likely to have advanced features, and will generally employ better warranties. If you’re not sure what you’re looking for or don’t have the time to shop around, we recommend the Zhiyun Crane 2 3-Axis Handheld Gimbal. It’s fairly expensive, but it boasts a number of excellent features. We believe it is the best DSLR gimbal stabilizer on the market. One of the hallmarks of a good gimbal stabilizer is its versatility. Gimbals can be somewhat large and bulky, and customization is a prized quality. Versatility is the prime selling point of the Pro Steady DSLR Rig System. This innovative design can be transformed to fit a variety of personal preferences. One of the big selling points is the shoulder mount that comes with this stabilizer. This is huge, because this stabilizer weighs three pounds, and when you combine it with a camera, it could easily be five pounds or more. Being able to rest it on your shoulder takes some of the strain off your arms, as your shoulder is better equipped to carry a load. The other thing I really like is how easy this stabilizer is to adjust. The joints adjust easily, and the grips are all cushioned, so you’re not straining your hands too badly. You can also connect mounting arms to the rig, enabling you to easily and conveniently set up your own lighting. This stabilizer doesn’t use batteries and it doesn’t have many advanced features that more expensive models have, but it is both practical and affordable, and its well-equipped to handle professional-grade camera equipment. The Neewer 24” Adjustable Handheld Stabilizer is more of a standard DSLR gimbal stabilizer. It comes with several useful features, such as a quick-release plate that can be adjusted to compensate for the weight of your camera, as well as an extendable body that allows for improved weight balance. Like the Pro Steady, the Neewer Adjustable Stabilizer favors a mechanical adjustment system over electronic brush motors. This renders it battery-free and frees you from worrying about battery life and stopping to charge the gimbal. In this way, more closely resembles a handheld tripod than a more advanced gimbal. The stabilizer adjusts from 15.2 inches all the way to 24 inches. The quick release plate extends from ¼ inch to 3/8 inch and is recommended for cameras up to six pounds. I don’t like the handle. The balance feels a little off to me, and I feel like I would end up straining my arms if I used this for hours at a time. But that’s just my concerns, not something I experienced yet. This brings me to my second issue: this stabilizer weighs almost five pounds. That might not sound like much, but after a couple hours, five pounds feels like quite a bit. This isn’t a bad product for the price, but I prefer the next model I reviewed. Since the Roxant Pro Video Camera Stabilizer is similarly priced with the Neewer Adjustable Stabilizer, the two gimbals invite comparison. And the Roxant Pro Video comes up almost ahead every time. First of all, the Roxant Pro weighs less than two pounds, making it a lot easier to handle for long periods of time. The comfort grip handle is a much higher quality than the simple foam handle on the Neewer. The Roxant Pro has excellent balance, and you receive a lifetime warranty on your purchase. 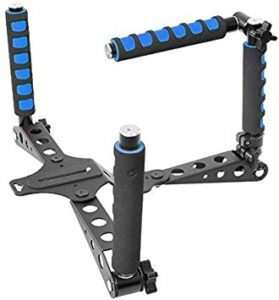 This is the #1 gimbal stabilizer on Amazon because it offers solid performance at a reasonable price. That said, there is one major flaw with this gimbal: it can’t support large cameras. While the Roxant Pro is perfect for an action camera, it isn’t rated for anything over two pounds, so you’ll do just fine if you have a mirrorless camera like the Sony a6500 or entry level DSLR’s with prime lens. Although the FlyCam HD-3000 24” Handheld Stabilizer bears a striking resemblance to the Neewer 24” Handheld Stabilizer, there are a couple of important differences. This is a higher-quality gimbal, and it features an adjustable three-axis plate that allows you to adjust the pan and tilt without ever having to touch the camera. Like the Neewer gimbal, the Flycam HD-3000 is strictly mechanical, and the three-axis gimbal is adjusted by moving a cushioned handle. A large number of counterweights on the bottom make it easy to adjust the vertical balance, accommodating larger, professional-quality cameras as well as smaller ones. That said, this gimbal is probably better suited for working with standard film-industry cameras over smaller handheld models. The Flycam is made of solid aluminum, which makes it quite durable. Unfortunately, that also makes it quite heavy. Weighing just under nine pounds, this is not something that’s going to fit in your pocket and is better suited for prolonged film shoots than quick videos. This is a durable, high-quality gimbal, but its hefty size means it’s not for everybody. It is mostly meant to use for lilightweight cameras like vlogging cameras or smaller DSLR’s. The Glidecam XR-PRO is the last of the manual, mechanical gimbals on this list. Since it isn’t recommended for cameras under four pounds, it’s not quite an all-around improvement, but it weighs less and supports heavier cameras, making this a good pick for professional photographers. The Glidecam XR-PRO is functionally the same as the FlyCam HD-3000. It features an adjustable 3-axis platform and is balanced by a series of counterweights at the base. The tricky part of using the XR-PRO is getting everything to balance smoothly. Trying to find what works for you is a bit of a trial-and-error process, but once you get it figured out, it works well. Like the FlyCam HD-3000, this is a good gimbal to buy if you’re on a budget and you want something that can handle a heavier camera like the Canon EOS C100 than the FlyCam. If you’re looking for a lot of fancy automated features, however, you’re going to have to pay a bit more. All of the gimbals I’ve written about to this point are mechanical stabilizers. But the FeiyuTech a1000 represents a major step forward, incorporating Bluetooth to connect with your smartphone and utilizing advanced adaptation technology that automatically adjusts to different cameras. Although it’s a little heavy, weighing nearly five pounds, the features make this a gimbal well worth considering. The a1000 is compatible with a wide range of DSLR and action cameras, and it can even connect with smartphones, making it one of the most versatile gimbals on the market. The gimbal features automated rotation and shutter control functions that make your time-lapse photography easier and look more professional. An ingenious three-axis design allows for 360 degrees vertical and horizontal rotation. Bluetooth connectivity lets you control the gimbal from your smartphone, or you can use the dedicated remote control as well. The frame of the FeituTech a1000 is also highly adaptable. With nine separate ¼ inch thread ports, there is plenty of room to extend the platform with additional accessories, such as tripods and lighting equipment. The biggest downside of the a1000 is its limited weight capacity. The recommended weight limit is 1000 grams, or just under two pounds, which means this gimbal won’t work with larger DSLR cameras. But if you’re using a smaller DSLR camera such as the Sony Alpha a5100, this is quite an effective gimbal. Although they’re both listed here as gimbals under $500, the 45 Degrees 3-Axis Motorized Gimbal is around $100 more expensive than the FeituTech a1000, and it shows. At 1.8 pounds, it’s less than half the weight of the a1000, and it can support cameras up to four pounds, giving it a much broader range of compatibility. Like most high-end gimbals, Bluetooth is built in so you can connect to your smartphone. It does a great job stabilizing your camera, and it has built-in tripod legs for hands-free use and stabilization. The gimbal has excellent battery life and runs for about ten hours on a single charge. It can also be used as a power bank. I’m not sure if it works with all camera brands, but it is compatible with Sony cameras at least. The gimbal also has a shutter compatible with Sony, Canon and Nikon cameras. There are several expansion ports on the bottom, including 3/8 and ¼ ports, so you can connect the gimbal with other devices, such as external microphones. It is also backed by a two-year warranty. Like the FeiyuTech a1000, this isn’t going to work for heavy DSLR cameras, but it’s a great choice for DSLR cameras up to four pounds. 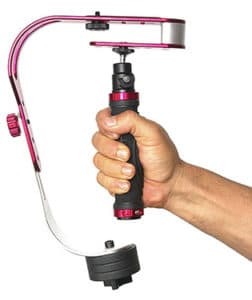 Like the two previous handheld gimbal stabilizers, the Glidecam HD-2000 is intended for use with smaller DSLR cameras, in this case, cameras weighing between two and six pounds. Unlike those two gimbals, however, this one is another manual gimbal. The Glidecam makes it easier for you to fine-tune the adjustments and balance for your camera, letting you get superior results no matter the size or weight of the camera. The mounting plate comes with a Manfrotto 577 Rapid Connect Adapter to secure your camera in place, and the frame is telescopic, allowing for easy adjustments. Both ¼ and 3/8 inch screw ports are available, leaving plenty of room for attachments. Unfortunately, this gimbal is fairly heavy, weighing more than eight pounds, which makes it somewhat disappointing that it isn’t equipped to handle heavier cameras. This is a sturdy, high-quality gimbal that delivers solid results, but since its strictly mechanical, you’re not getting a lot of the extra features found in many gimbals of a similar price. One of the great things about the Glide Gear Geranos VII is its vest/arm mount, which lets you strap the gimbal around your neck for superior balancing and control. This is one of several things that helps to set this premium gimbal stabilizer apart from the competition. Thanks to its intelligent design, this gimbal is both expertly balanced and easy to use, weighing less than two pounds. It runs on lithium-ion batteries and provides up to eight hours on a single charge. Three-axis motors provide 360 degrees of rotation, and it works with the Zhiyun app to help you take charge of your filming experience. The gimbal even comes with a hard case to pack everything in, making it easy to store and to transport. Although this is fairly expensive, the excellent accompanying features make this one of the best DSLR gimbals on the market. With an impressive running time of 18 hours, the Zhiyun Crane 2 is one of the longest-running gimbals on the market. It is packed with a number of incredible features and connects directly with the Zhiyun App to give you more freedom and control over your creative enterprises. One of the most impressive features is the precision focus lens. Utilized via a camera cable connection, this lens gives you a plus/minus 0.02 degree precision control for your lens for incredible focus. 32-Bitx3 High-Speed MCU parallel control gives amazing anto-shake stabilization, and a handy OLED display provides a great deal of useful information and parameter controls. Thanks to its impressive battery life, the gimbal can also be used as a power bank for your camera, letting you shoot longer than you would normally be able to. With a maximum weight limit of seven pounds, this gimbal can support a wide range of DSLR cameras, and its excellent features improve the quality and stability of your footage. Although it’s somewhat expensive, this gimbal is worth the price. The DJI Ronin-M is the ultimate in high-tech gimbal stabilization. With its modern, space-age design, you can tell at a glance that this gimbal means business. It’s carefully manufactured magnesium frame is one of the most durable you will ever find. The Ronin-M weighs just five pounds, which is surprisingly lightweight for all of its size and capabilities. It can support cameras weighing up to eight pounds. The gimbal has three different modes of operation, and you can switch between them seamlessly at the push of a button. The camera plate is mounted on a movable arm that allows for incredible precision and control when filming, opening up your possibilities tremendously. Although this is a fairly expensive gimbal, the combination of high-quality construction and advanced features make this one of the finest products on the market. If you’re looking to elevate your filmmaking game, a gimbal is the way to go. Your filmed footage will look better and more professional, giving your videos the polish they need to stand out from the competition. Please make sure to leave a comment and share which Gimbal Stabilizer you’d buy.